Bright, sparkling white teeth that rival those of the celebrities? Sign me up, please! Given the choice, I don't know who among us wouldn't crave pearly whites. So when I came across GO SMiLE's Go All Out Starter Kit, I was immediately drawn to it. For "starters," I absolutely love the packaging! Everything is so nicely laid out -- it makes it hard to even want to disturb the pretty, orderly look to get at the items included. But if I can be less than Type A just for one second, I would definitely like to delve right in. 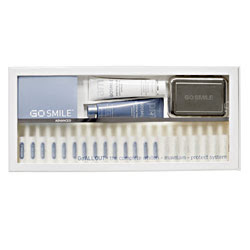 14 ampoules of GO SMiLE's Advanced Formula B1 each reside within their own tiny slots and are accompanied by a refillable silver compact to really make whitening teeth more fun. And as if that's not enough, the kit comes with GoSMILE AM/PM Whitening Protection Fluoride Toothpastes ... which, if they're anything like the Anticavity/Antigingivitis Rinse and Peppermint Candy Smile Toothpaste by the same brand, are sure to become new favorites of mine.